Light is necessary for life and growth. We are introduced to light in the biblical account of creation. Of Jesus, the Gospel of John says, “In him was life, and the life was the light of men” (John 1:4 ESV). David spoke of meditating on God during the watches of the night (Psalm 63:6). He watched his sheep by night, but most work was not done in the night prior to the introduction of electric power. We used one Aladdin lamp and a few kerosene lamps in our home in the rural South until I was about 8 or 10 years old. Then we began to use a single electric bulb in a room when we needed to be in the room. We must work the works of of him who sent me while it is day; night is coming, when no one can work. As long as I am in the world, I am the light of the world” (John 9:4-5 ESV). 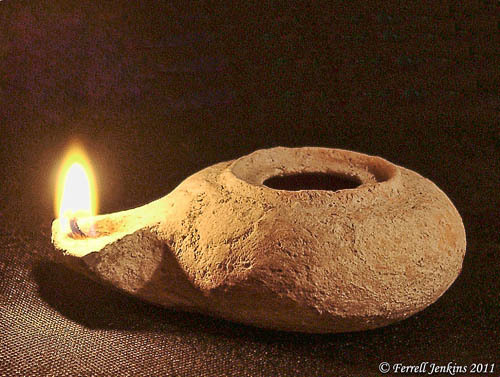 Herodian period lamp from the time of Jesus. Photo by Ferrell Jenkins. The photo above is one of the Herodian period lamps I have purchased in the Bible lands over the past 44 years. Two or three times I have used some olive oil (or Wesson oil, or a small piece of a candle) to show how much light the lamp gives. The Apostle Paul commanded the saints at Philippi to shine as lights in the world. This entry was posted in Bible Lands, Bible Study, Culture, Israel, New Testament, Old Testament, Photography and tagged Apostle Paul, Ministry of Jesus. Bookmark the permalink.